A manufacturer who properly researches the marketplace and determines the opportunity for supplying needed products is bound to make a lasting impression on the industry. Premier Concrete is that type of manufacturer. 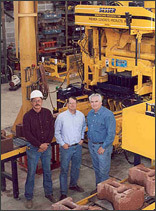 In 1996, Premier Concrete Products, Inc. established a concrete products manufacturing plant in Houston, Texas with an administrative office in Louisiana. To better serve our customers we added to our portfolio a fully automated facility in Watson, Louisiana in 2000. Premier owns 40 molds and is currently producing Keystone retaining wall units, masonry, erosion and landscape-type products. We supply products for two major types of customers: masonry contractors and retail stores. Not only are we able to produce blocks that are of the highest quality, but also in a wide variety of colors and at the most competitive prices. We strive to bring you quality products and we make your satisfaction our business! For general information please e-mail info@premier-concrete.com.